HES. Home Entertainment Suppliers. One of the most legendary gurus of unlicensed video games the world over. Well, Australia and New Zealand over anyway. HES was an interesting company, they released a bunch of unlicensed NES games that usually were absolute crap and Nintendo eventually got so fed up with them that they started implimenting all kinds of secret plans to hinder their game production. 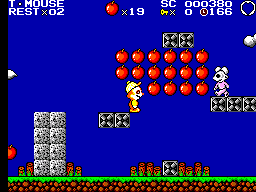 HES kept on kicking, however, and eventually had things like "piggyback" games, where the game would only work by being powered using a licensed game. Interesting, huh? Surprisingly, 4 Pak All Action is the ONLY game they released for the SMS. This is surprising for two reasons. First off, the NES wasn't as popular abroad as the SMS was (except for some places like Germany), and yet HES chose to release a ton of games for it. Second, more importantly, the SMS didn't have any lock-out features on it that they would have had to deal with. It's a curious thing, if you think about it. At any rate, 4 Pak has four games to be found therein, listed in this review in the order they appear on the box (actual order is different in the game). Please keep in mind that each section will be separated into four parts because each game is different, effecting the overall value of this game separately. Power Block This is by far the BEST game on 4 Pak All Action, and in fact, one of the best games I've ever played. It's really nicely done. Basically, it's something like Woody Pop, except that your paddle moves vertically instead of horizontally, so thus everything your ball hits is on the right of you, not above. The concept behind the game is strange, it has a weird mythological feel to it and even an opening story. It's really curious. Every level you have to destroy different kinds of barriers, some that are pretty strange (paint tubes, smiling faces, cakes, etc. ), collect power-ups, and then fight a boss after you clear everything. There is a larger target in the middle of every level that you have to destroy to pass. You don't have to eliminate everything else to do this. I think there are about 24 levels or so. Lots of interesting stuff going on, and in fact, there's even a two-player SIMULTANEOUS option where one of you is on the left and the other on the right for added fun! Makes sense then why they set it up the way they did. It's really a great game. You can even use your Sega Sports Pad SUCCESSFULLY for that "arcade" feel. Adventure Kid And then they have to go on and do this. Talk about horrible. This is by far one of the worst things I have ever played. 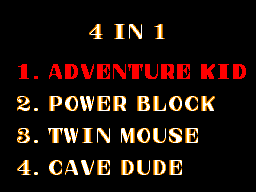 Adventure Kid, interestingly enough, is a COMPLETE hack of Adventure Island II for the NES, it's just, really, REALLY bad. It almost seems incomplete in a way. It's just awful. You run around chucking stone axes, hitting enemies, riding dinosaurs, it's all there, and it's virtually all the same. Cheaters. Twin Mouse Hmmmm, getting a little better, after playing that last one. But, yet, HES is smart, just not smart enough. This game, in fact, is a nearly complete hack of Tiny Toon Adventures for the NES, except with mice instead of the main characters and some simple enemy changes. It's pretty basic. There aren't any power-ups other than the "change into mouse girlfriend and back" thing that you can pick up, and a bunch of thingies to collect to get extra lives. There aren't any bosses either. It's a bit too simple for my tastes. There is a certain level to "suckiness" that I expect sucky games to achieve. Cave Dude Okay, now they're back on track, they even got their hacking down better so they're more sneaky. It's like Adventure Kid and Twin Mouse were experiments leading up to this one or something. 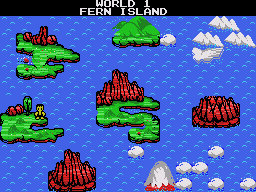 Anyway, Cave Dude has hacked elements from Super Mario Bros. 3 and Super Mario World, but they're so well hidden that you will hardly notice anything. There are power-ups for your club, lots of stuff to collect, a variety of enemies, and big, interesting bosses. It even has a decent ending. It's a basic run and hit crap game otherwise, but definitely good considering what else 4 Pak has to offer. There are 8 levels with three rounds each. Power Block Very nice. Fluid, lots of splendid colors everywhere, and a hell of a lot of detail. The opening sequences are good too, it's all around great in this area. Adventure Kid Wow. Good god this is just, I can't go on. Okay. You really have to see this to believe it. It's almost like HES just said "screw it" and decided to stop with the graphics after they finished most of the backgrounds. The character animations are akin to Atari 2600 capabilities, no joke. For example, when you get on the first dinosaur you find, you'll notice that you can SEE THROUGH IT to the background behind. Wow. And, to add to this, the screen moves terribly, like a choppy reel-to-reel missing several segments of film. It's just awful. Twin Mouse Not too bad, better than Adventure Kid, but still not good. The backgrouds are way too dark sometimes and HES really didn't do a good hacking job. It's pretty half-assed overall and if you're familiar with Tiny Toon Adventures, you'll pick up on what they did. The title screen is a rank hoot and a half. Cave Dude And back we go again, full circle to awesomeness. Very nice, the graphics are splendid overall with nice animations and color schemes. Some of the bosses are VERY nicely detailed. This picks ole' 4 Pak back up out of the mire Adventure Kid tossed it in. Power Block Again, very nice. Overall great. Catchy tunes, excellent sound effects. All of them are very fitting. Adventure Kid Oh my. This. Just. Wow. The same annoying song over and over and OVER again until you are driven insane. Even the music sounds incomplete just like the graphics and the sound effects aren't any better. Twin Mouse Hmmmm, not too bad, not really. The music is pretty basic, not very catchy, but it fits. The only problem is the sound effects, they seem almost like they're overamplified. It's odd. They don't really fit correctly. Cave Dude And back again. Great music and sound effects. Catchy tunes that you'll hear as you go to sleep. Power Block Hmmm, a little hard to get used to. This is mainly from the fact that the game is set up vertically instead of horizontally. You'll get used to it. Even the Sega Sports Pad finally has a game where it can be used efficiently. Adventure Kid This is probably the only thing good about this game. If it weren't for the choppy screen scrolling, they would have been nearly flawless. Twin Mouse Fine, very basic. There is only one problem. When you jump onto a platform, including the ground, your mouse will have the tendency to move to the right or left depending on which way you are jumping. You'll likely lose several lives until you get the hang of this odd programming error. Cave Dude Very nice, no problems at all. The controls respond very well. Power Block I'll definitely come back to this one. It's the only game I haven't beaten on 4 Pak that I want to beat. Tons of variety, lots of fun, gets pretty difficult, and the two-player simultaneous feature is just incredible. Great game. Adventure Kid I come back to this one to laugh once in awhile, but you'll seriously hurt your eyes trying to play it. I didn't have the patience to try to finish it. Twin Mouse It's short, and simple, but I doubt I'll come back to it, there's just not enough going on to want to check it out again. Maybe I'll show it to my kids. Cave Dude Though I beat this game in a relatively short amount of time, it's not exactly easy and has some challenges points to it. Plus, it's just a good game, simple concept, but very well done. Please keep in mind that the ratings given above are for 4 Pak All Action AS A WHOLE. Not separately. I took each game and it's features into account when I rated this game. It's a very interesting rarity that is definitely one of the hardest games to locate, but I'd say it's worth it. It's worth it for just Power Block alone, since we really didn't get vested with Woody Pop like we were supposed to. It's a shame considering the history of HES that they didn't release a sibling or two for 4 Pak, but alone it's good enough and an interesting piece of video game history. I'm out, biatches.